April 1935: first stage appearance at the Tôkyô Gekijô, where he receives the name of Ichikawa Takashi and plays in the dance "Onatsu Kyôran". August 1940: his adoptive father Ichikawa Shôchô II dies. May 1945: his master Ichimura Uzaemon XV dies. August 1946: Ichikawa Takashi becomes nadai and takes the name of Ichikawa Shôchô III. July 1951: premiere at the Kabukiza of Uno Nobuo's drama "Jiisan Baasan"; Shôchô plays the role of Kyûya's wife Kiku [casting]. July 1953: revival at the Meijiza of Kawatake Shinshichi III's 1878 drama "Tsûzoku Saiyûki"; Shôchô plays the role of the kanjo Sakan [casting]. May 1954: Shôchô achieves a great success at the Kabukiza with his performance in the drama "Genji Monogatari". October 1955: first Kabuki tour in the Popular Republic of China, in Beijing (2~13 october), Shanghai (17~18 october) and Guangzhou (24~25 october); Shôchô plays the role of Hanako in the dance "Meoto Dôjôji" [more details]. Shôchô has the opportunity to meet the stars of the Chinese Traditional Opera like the famous Mei Lan-Fang. March 1956: premiere in Kabuki at the Meijiza of Hôjô Hideji's drama "Ii Tairô"; Shôchô plays the role of Masako-no-Kata [more details]. February 1960: premiere at the Kabukiza of Uno Nobuo's drama "Shiranui Kengyô"; Shôchô plays the role of Shichibei's wife Oshin [casting]. April 1960: premiere at the Kabukiza of Hagiwara Yukio's dance-drama "Onizoroi Momijigari"; Shôchô plays the role of a female retainer, in reality a female demon [casting]. February 1962: Ichikawa Shôchô III takes the name of Ichikawa Monnosuke VII at the Kabukiza, playing in "Izumo Okuni" and "Kusazuribiki". November 1962: revival at the Kabukiza of the drama "Fudô", which belongs to the Kabuki Jûhachiban; Monnosuke plays the role of the koshimoto Tsuruha, in reality Kumedera Danjô's sister Matsugae [more details]. October 1965: Monnosuke takes part in the first Kabuki tour in Western Europe, playing the roles of Chidori and Kaoyo Gozen in the dramas "Heike Nyogo no Shima" and "Kanadehon Chûshingura" [casting]. March 1967: revival at the National Theatre of Tsuruya Nanboku IV's masterpiece "Sakura Hime Azuma Bunshô", which is supervised by Gunji Masakatsu; Monnosuke plays the role of Yoshida Matsuwaka [casting]. March 1975: revival at the National Theatre of Kawatake Shinshichi II's drama "Jiraiya Gôketsu Monogatari"; Monnosuke plays the role of Ayame [casting]. April 1976: revival at the Meijiza of Katsu Genzô III's drama "Ogasawara Sôdô"; Monnosuke plays the roles of Odai-no-Kata and Ohaya [casting]. April 1977: revival at the Meijiza of Katsu Genzô II's drama "Kimi-wa-Fune Nami no Uwajima"; Monnosuke plays the roles of Hatsune and Otatsu [casting]. May 1977: revival at the Minamiza of Katsu Genzô III's drama "Ogasawara Sôdô"; Monnosuke plays the roles of Odai-no-Kata and Ohaya [casting]. July 1977: revival at the Kabukiza of Katsu Genzô III's drama "Ogasawara Sôdô"; Monnosuke plays the roles of Odai-no-Kata and Ohaya [casting]. July 1980: revival at the Kabukiza of the never-performed 5th act of "Yoshitsune Senbon Zakura"; Monnosuke plays the role of Shizuka Gozen [more details]. March 1981: revival at the National Theatre of Kawatake Mokuami's drama "Jitsugetsusei Kyôwa Seidan"; Monnosuke plays the role of the okujochû Takekawa, in reality Kôjûrô's sister Otsuta [casting]. July 1981: revival at the Kabukiza of Tsuruya Nanboku IV's drama "Hitori Tabi Gojûsan Tsugi"; Monnosuke plays the role of Osode [casting]. June 1983: Monnosuke receives a special cultural prize awarded by the city of Bolognia in Italy. April 1987: Monnosuke takes part in the revival at the Meijiza of the play "Jûni Hitoe Komachi Zakura", which includes the famous Tokiwazu-based dance-drama "Tsumoru Koi Yuki no seki no To" [more details]. July 1990: Monnosuke appears on stage for the last time, at the Kabukiza, where he plays the role of Izutsuya Denbê in the drama "Horikawa"; his stage partners are Ichikawa Danshirô IV (the sarumawashi Yojirô) and Nakamura Shibajaku VII (Oshun). 13 October 1990: Monnosuke dies. 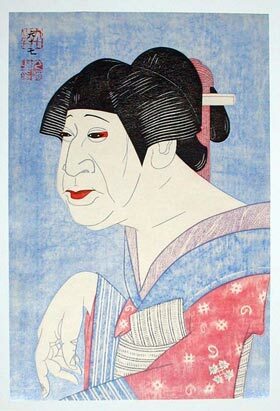 Ichikawa Monnosuke VII was an outstanding supporting onnagata and nimaime, trained by two great actors, Ichikawa Shôchô II for the onnagata roles and Ichimura Uzaemon XV for the tachiyaku roles. He performed a lot with Ichikawa Ennosuke II from 1945, became a leading actor at the Tôyoko Hall (Tôkyô) and later on the tateonnagata of the troupe led by Ichikawa Ennosuke III. He was a well-cultivated man who took part in many TV Quizz shows.